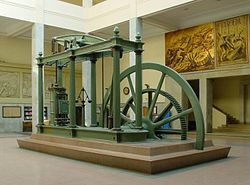 A Watt steam engine, which powered the Industrial Revolution in the United Kingdom and played a key role in it becoming the world's first industrialised nation. Science and technology in the United Kingdom has a long history, producing many important figures and developments in the field. 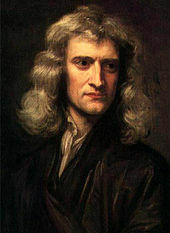 Major theorists from the UK include Isaac Newton whose laws of motion and illumination of gravity have been seen as a keystone of modern science and Charles Darwin whose theory of evolution by natural selection was fundamental to the development of modern biology. Major scientific discoveries include hydrogen by Henry Cavendish, penicillin by Alexander Fleming, and the structure of DNA, by Francis Crick and others. Major engineering projects and applications pursued by people from the UK include the steam locomotive developed by Richard Trevithick and Andrew Vivian, the jet engine by Frank Whittle and the World Wide Web by Tim Berners-Lee. Scientists from the UK continue to play a major role in the development of science and technology and major technological sectors include the aerospace, motor and pharmaceutical industries. England and Scotland were leading centres of the Scientific Revolution from the 17th century and the United Kingdom led the Industrial Revolution from the 18th century, and has continued to produce scientists and engineers credited with important advances. Some of the major theories, discoveries and applications advanced by people from the UK are given below. The laws of motion and illumination of gravity, by physicist, mathematician, astronomer, natural philosopher, alchemist and theologian, Sir Isaac Newton (1643–1727). The discovery of hydrogen, by Henry Cavendish (1731–1810). The steam locomotive, by Richard Trevithick (1771–1833) and Andrew Vivian (1759–1842). The electric motor, by Michael Faraday (1771–1867), who largely made electricity viable for use in technology. The theory of aerodynamics, by Sir George Cayley (1773–1857). The first public steam railway, by George Stephenson (1781–1848). 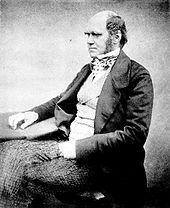 The first commercial electrical telegraph, co-invented by Sir William Fothergill Cooke (1806–79) and Charles Wheatstone (1802–75). First tunnel under a navigable river, first all iron ship and first railway to run express services, contributed to by Isambard Kingdom Brunel (1806–59). Evolution by natural selection, by Charles Darwin (1809–82). The invention of the incandescent light bulb, by Joseph Swan (1826–1914). The unification of electromagnetism, by James Clerk Maxwell (1831–79). The first practical telephone, patented by Alexander Graham Bell (1847–1922). The discovery of penicillin, by biologist and pharmacologist, Sir Alexander Fleming (1881–1955). The world's first working television system, and colour television, by John Logie Baird (1888–1946). The first meaningful synthesis of quantum mechanics with special relativity by Paul Dirac (1902–84) in the equation named after him, and his subsequent prediction of antimatter. The invention of the jet engine, by Frank Whittle (1907–96). The invention of the hovercraft, by Christopher Cockerell (1910–99). The Turing machine, by Alan Turing (1912–54), the basis of the modern computer. The structure of DNA, by Francis Crick (1916–2004) and others. The theoretical breakthrough of the Higgs mechanism to explain electroweak symmetry breaking and why some particles have mass, by Peter Higgs (1929-). Theories in cosmology, quantum gravity and black holes, by Stephen Hawking (1942–). The invention of the World Wide Web, by Tim Berners-Lee (1955–).